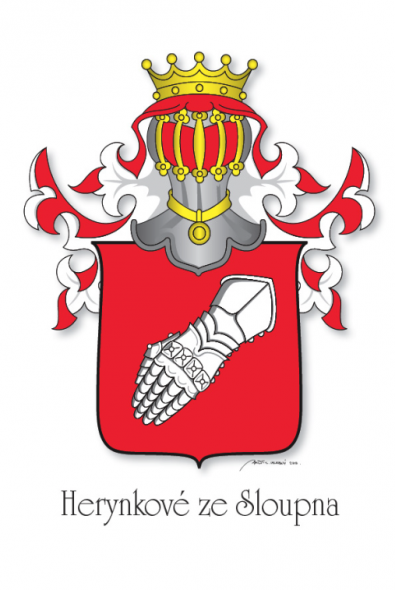 Why not to have your own family coat of arms? 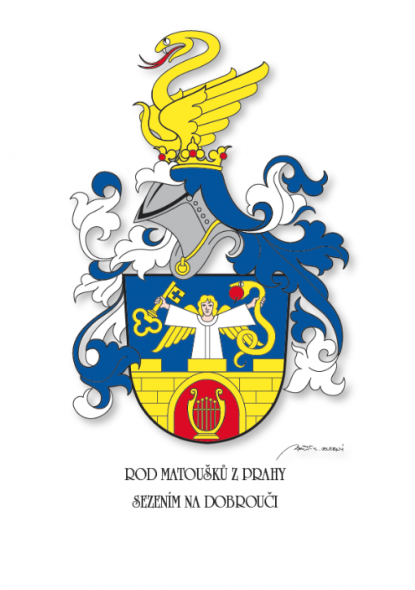 Developing of emblems and heraldry in general is a great passion of Zdeněk Velebný, a respected heraldist and artist. 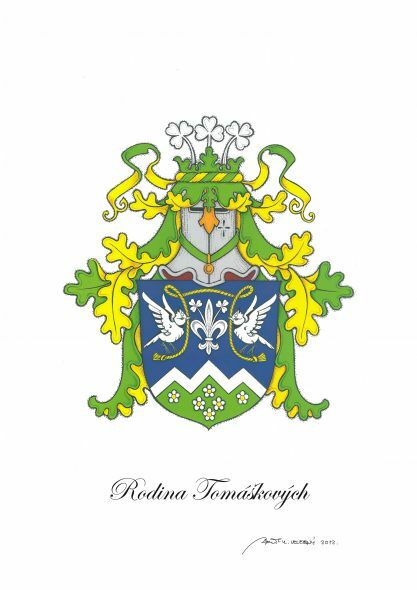 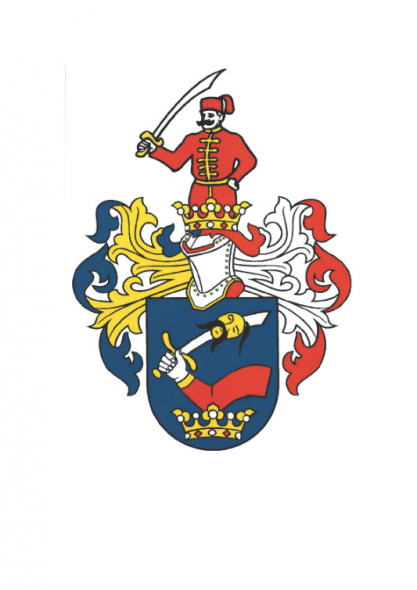 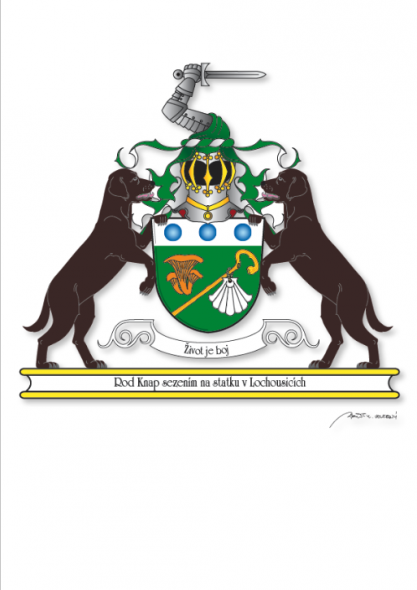 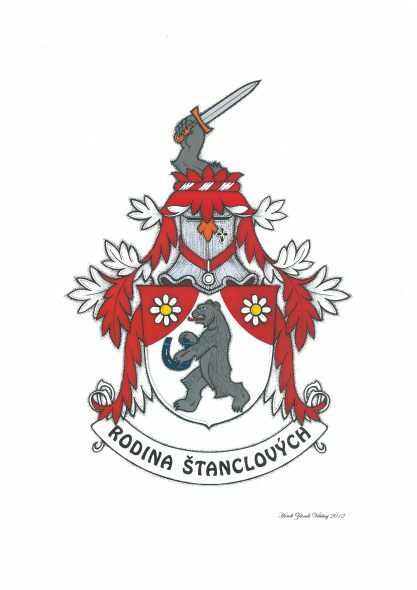 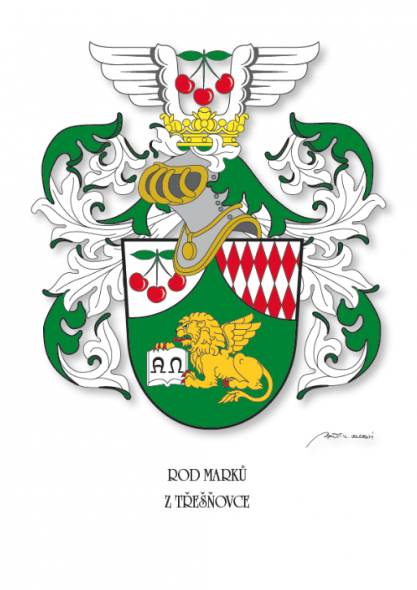 Thanks to his rich experience gained when designing municipal and family coats of arms in the Czech Republic and abroad, you family may have a representative family emblem! 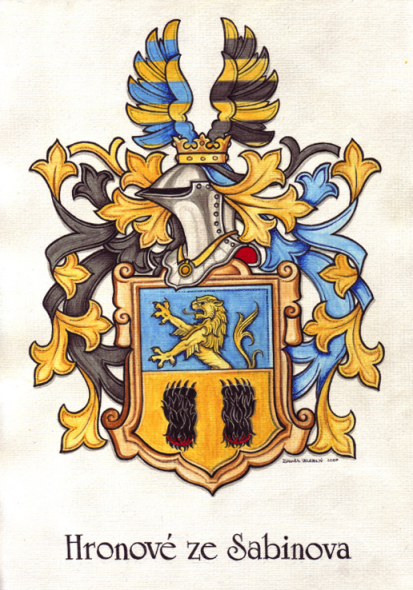 Heraldic coats of arms were first created in Western Europe in the second third of the 12th century. 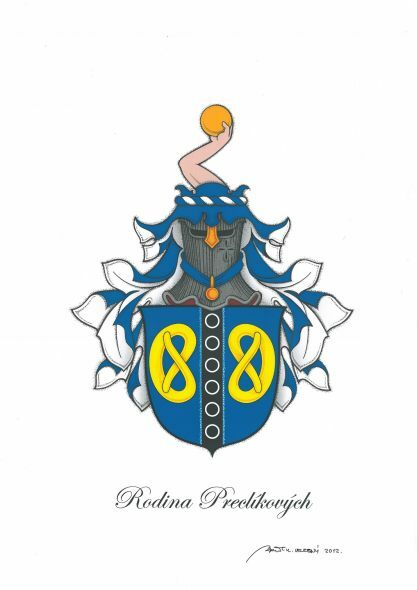 They were used by noblemen as a distinguishing mark, mainly when fighting. 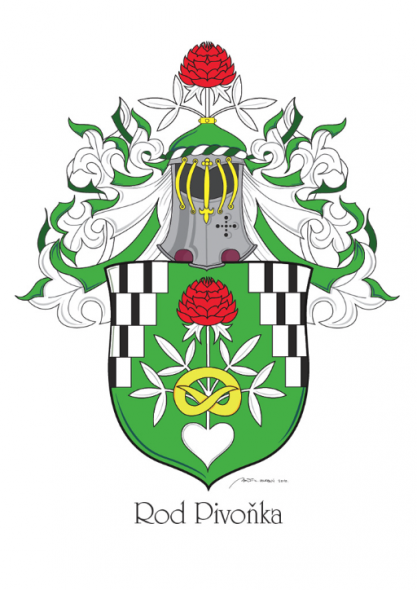 Coats of arms were hereditary. 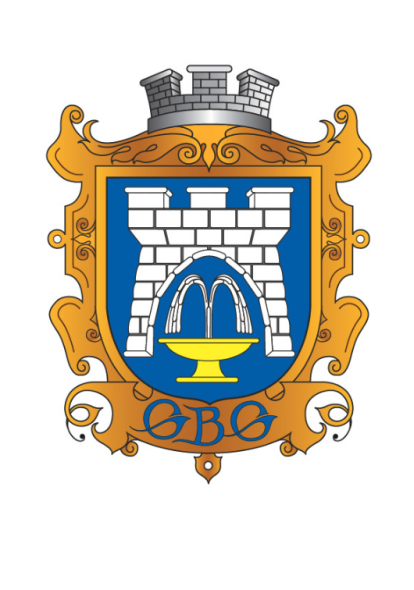 Later on, emblems were granted to selected entities (for examples, to towns). 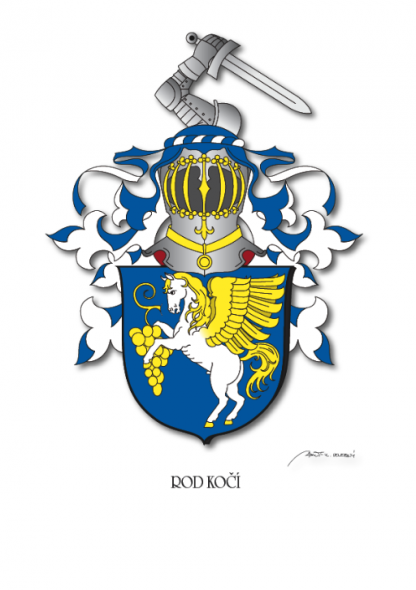 The family coats of arms designed and hand-made by heraldist Zdeněk Velebný may be used by every family, individual, association or company in the Czech Republic. 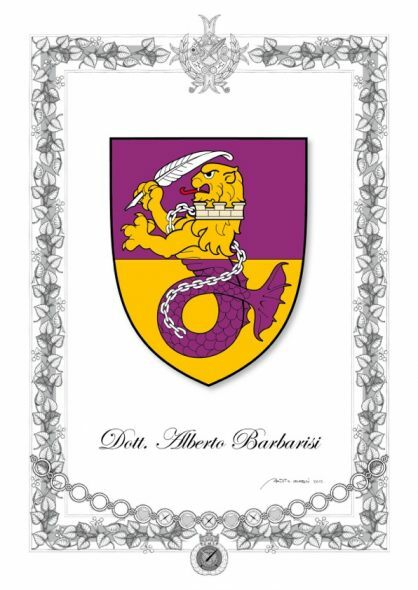 The heraldist utilises his knowledge obtained through genealogical research as heraldry and genealogy are closely connected to each other. 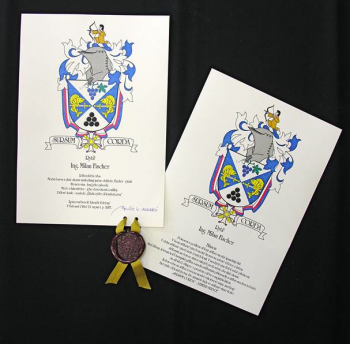 Furthermore, the heraldist follows from e.g. 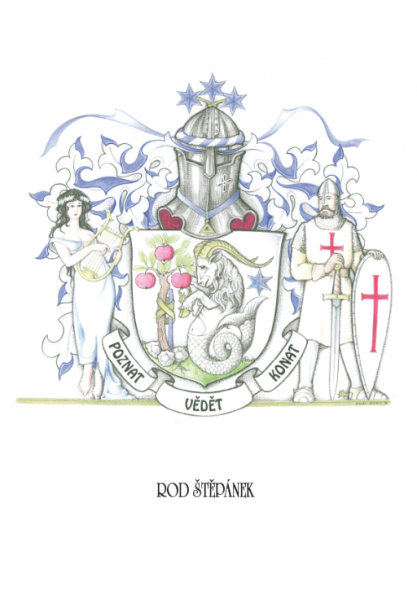 names, birth places, historic sources and hobbies of the husband and wife. 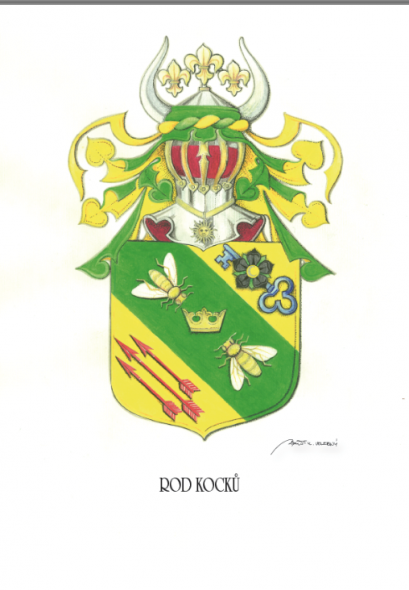 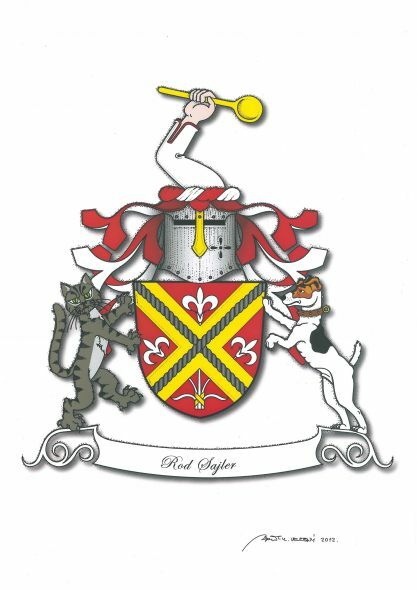 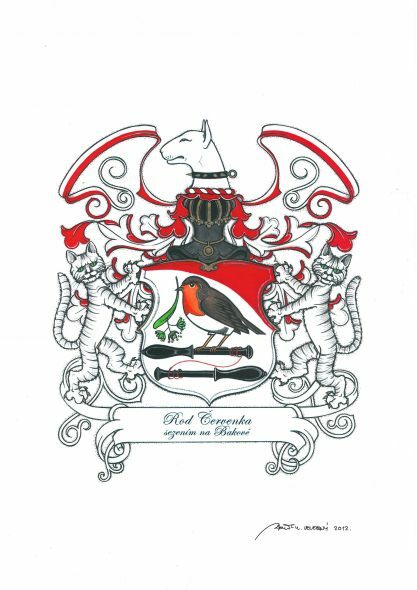 A family coat of arms is a nice gift at the occasion of a jubilee, wedding, Christmas, etc. 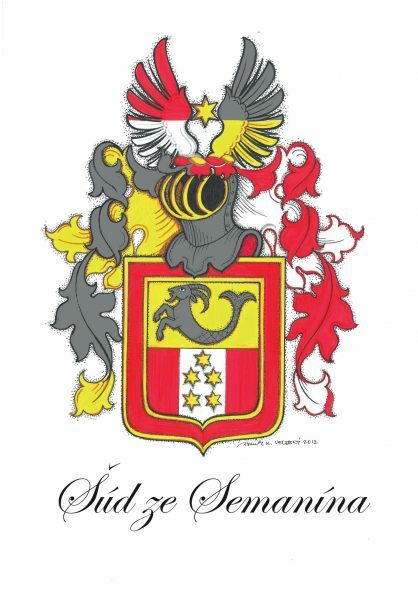 A silver-and-blue shield of Spanish type, divided diagonally from the left and right upper corners. 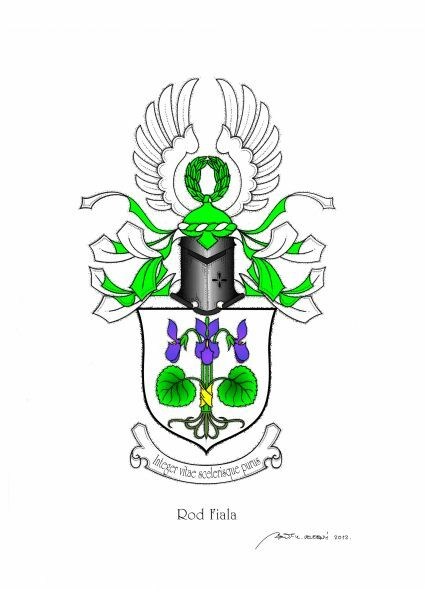 In the upper silver segment, there is a blue bunch of grapes on a green branch with a leaf. 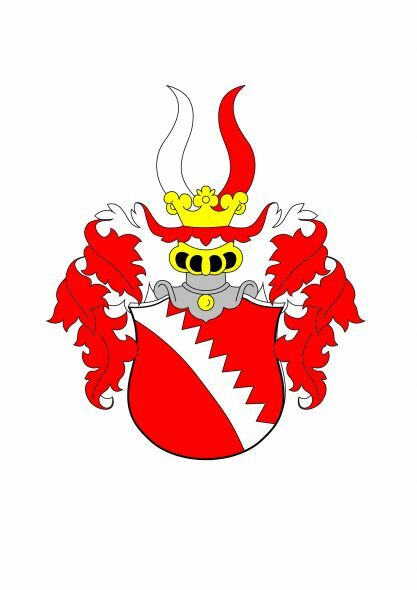 The bottom silver segment shows six black cannon balls. 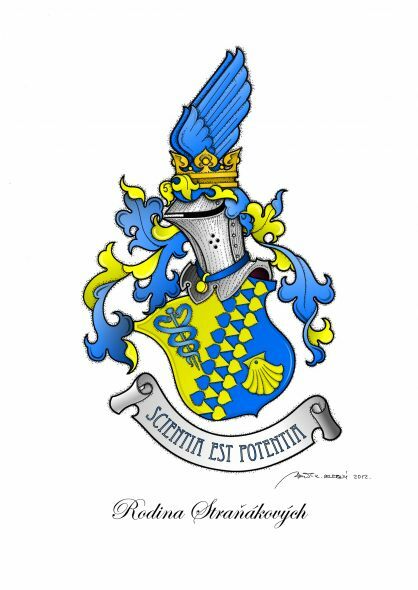 In the blue segments, facing each other are two golden perches pierced with silver swords with golden handles. 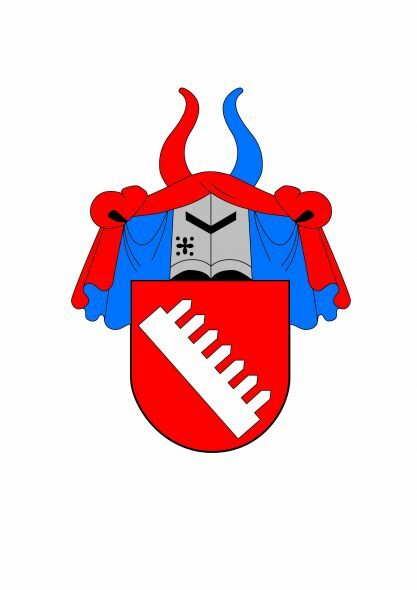 Above the shield, there is a tournament helm of iron, with blue-and-silver mantling and a silver-and-blue torse, on which a boy wearing plain clothes is kneeling. 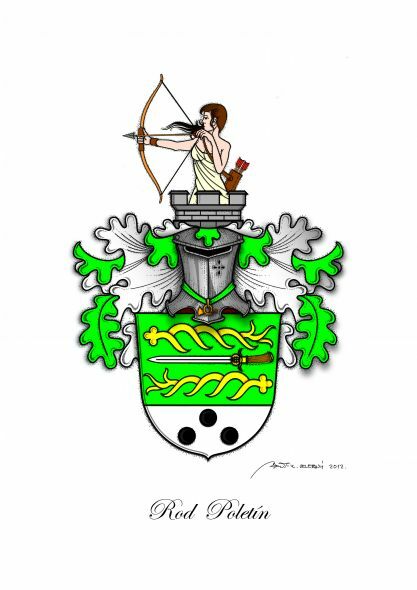 The boy is holding a longbow ready to shoot. 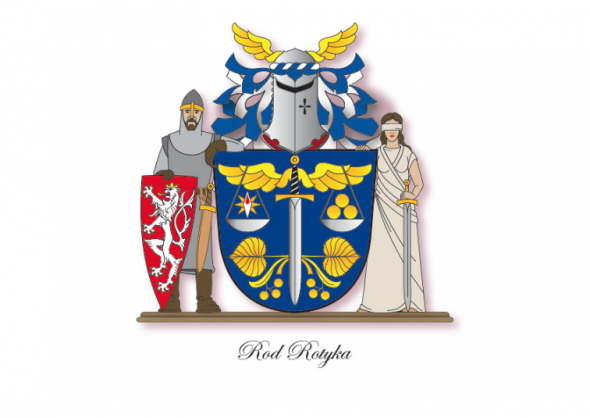 Around the shield, hanging on a silver-red-blue tricolour ribbon, there is an order of the cannon knight. 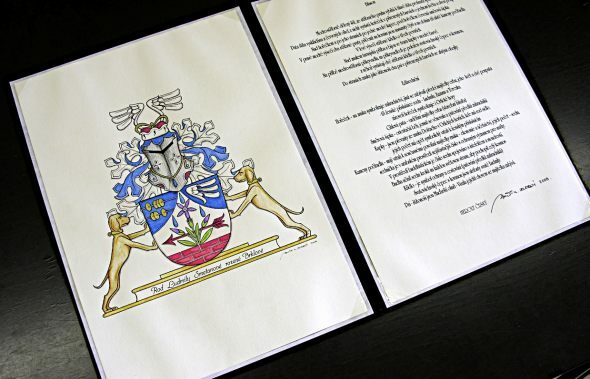 The motto on the sides of the order, on a silver ribbon, reads, SURSUM CORDA" = "LIFT UP YOUR HEARTS". 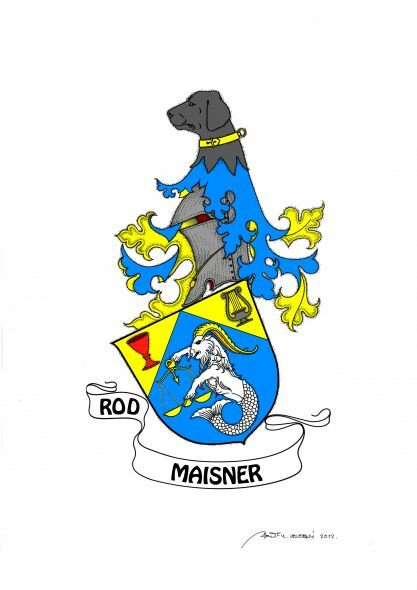 The blue colour and the golden perches symbolise the name (Fischer = fisherman). 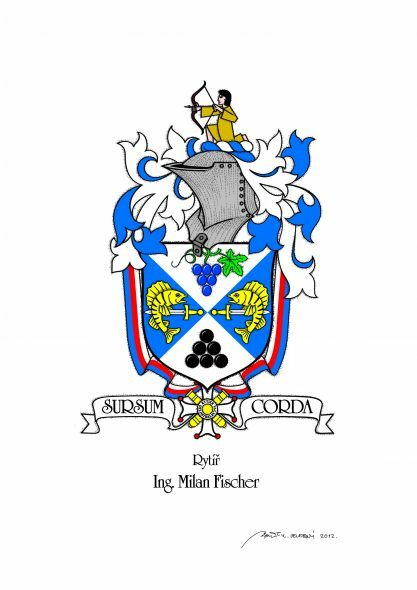 The grapes represent the region of the family origin. 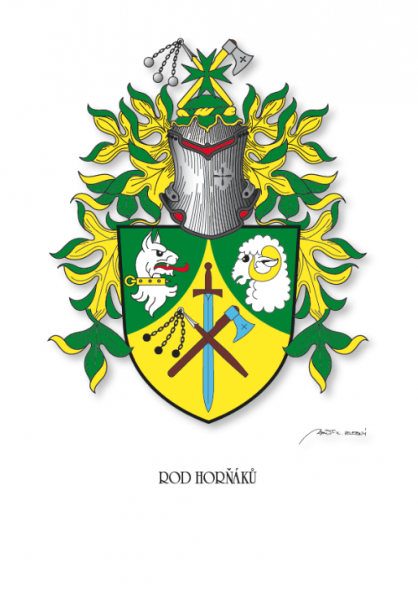 The swords and the bowman symbolise the skills and hobbies. 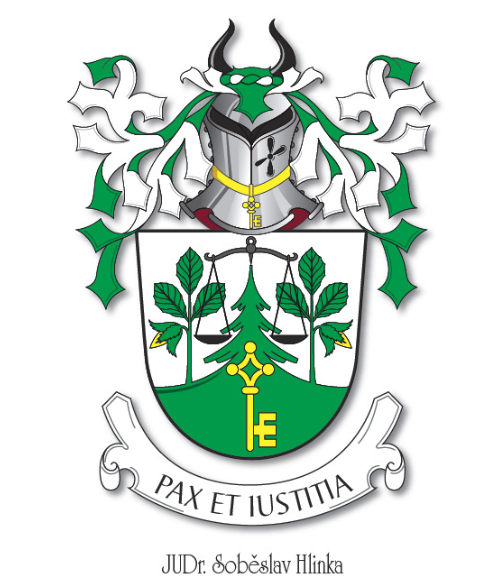 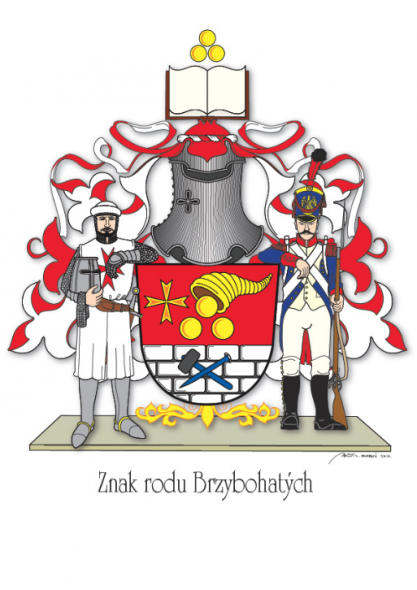 The cannon ball means that the bearer of the coat of arms was awarded with the "Order of the Cannon Knight". 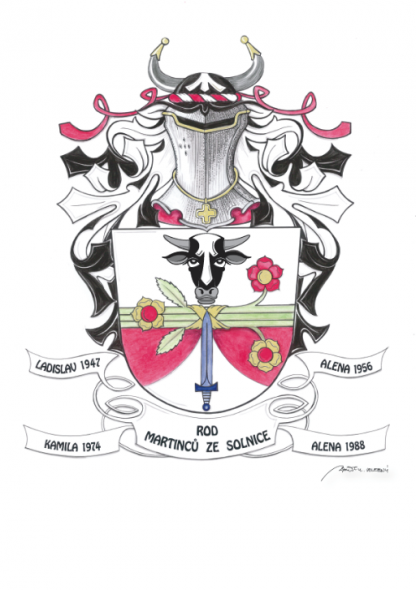 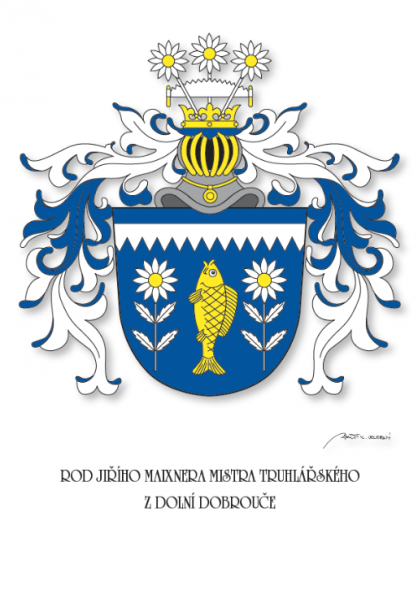 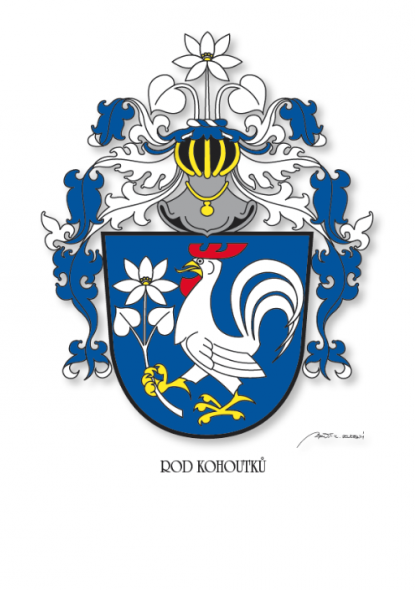 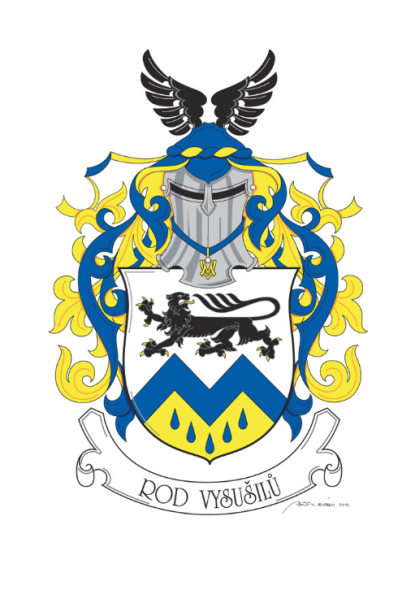 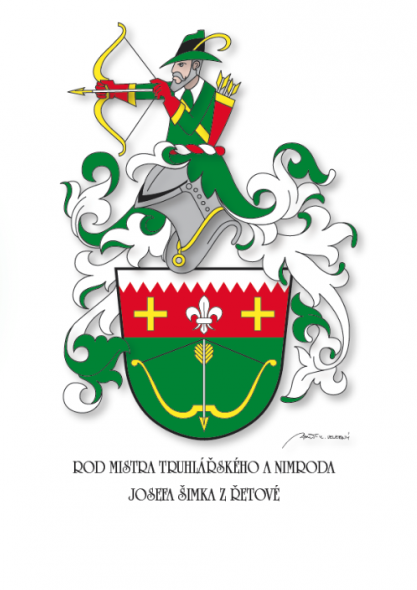 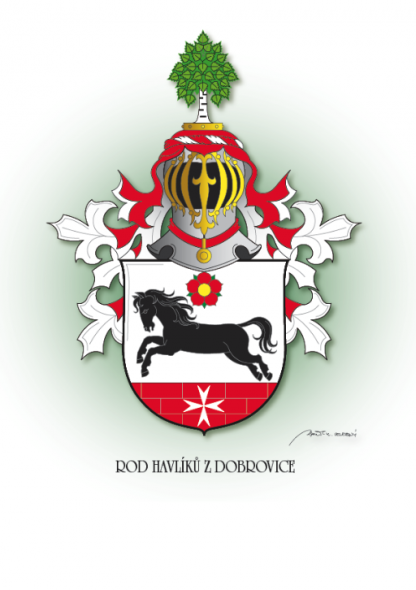 Zdeněk Velebný can design and develop a graphic design of a coat of arm for your family. 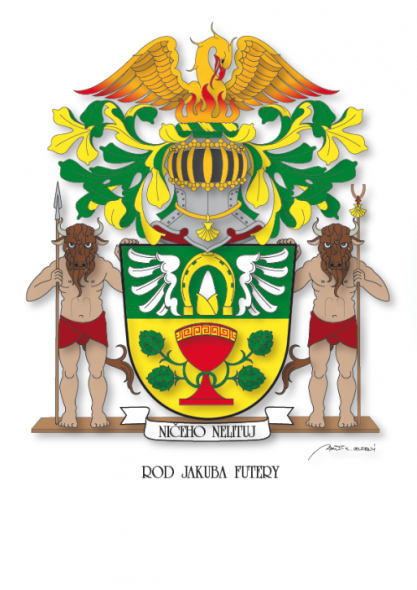 Special graphic paper or hand-made paper is used as the base material for the final version. 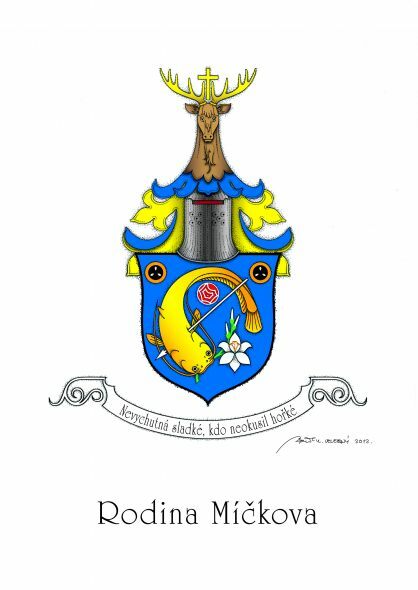 The coat of arms is supplied in a frame, in a passe-partout or in another form, depending on your wish. 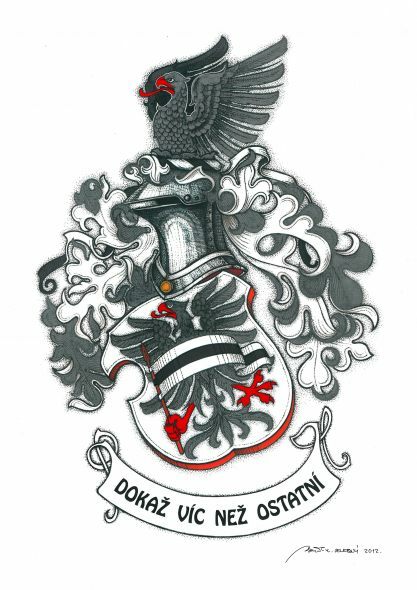 Alternatively, coats of arms can be embroidered. 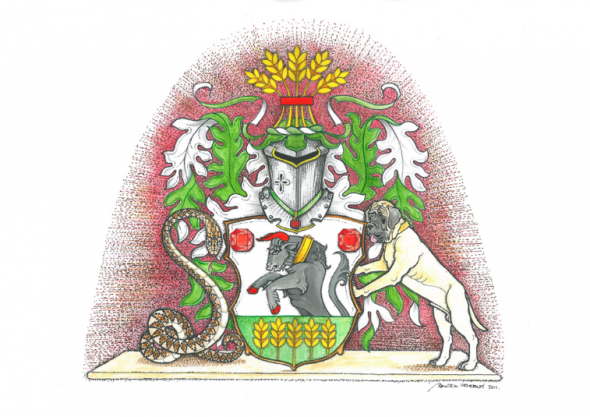 As regards the technique, coats of arms are created on traditional automatic embroidering machines and finalised by hand embroidery. 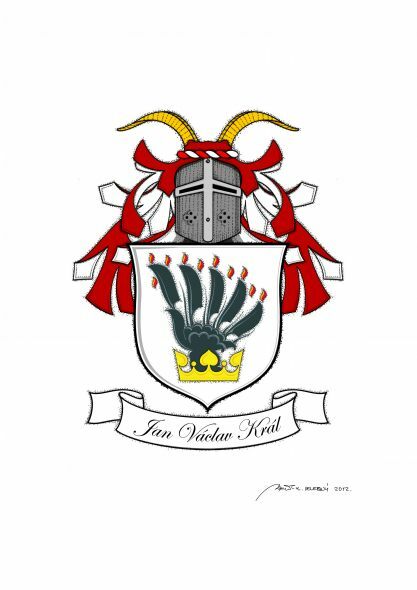 The result is a wall emblem. 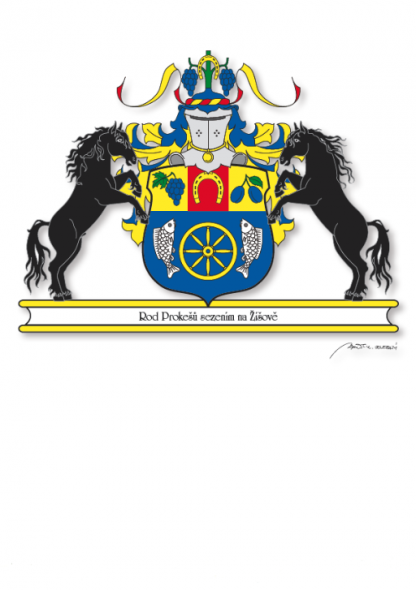 The base material is velvet used for flag making, decorated with golden metal tassels at the bottom. 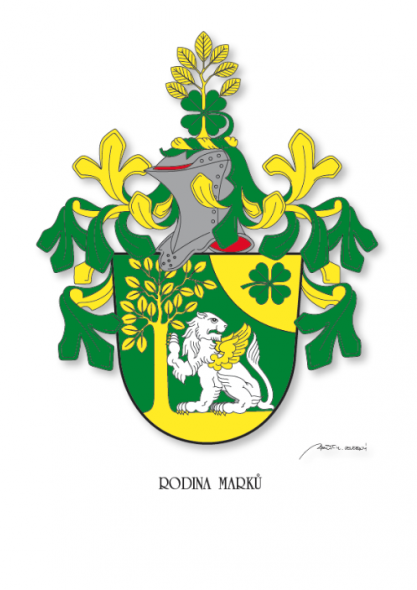 Another option is a less complicated automatic embroidery work, which is suitable for bigger quantities, for example, for T-shirts, blouse shirts, caps, etc., or for tabs or appliqués in various sizes. 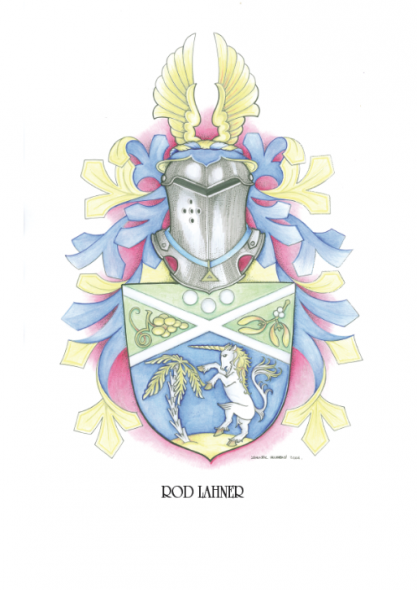 Family coats of arms can be forged by our artistic forger. 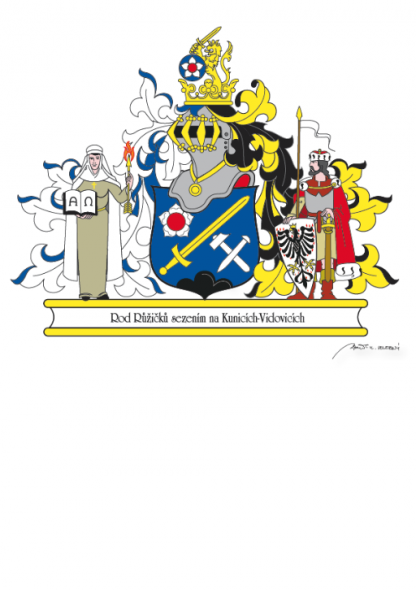 They are made of copper or iron and designed for installation on the building.